It’s time for favorite celebrity baby names 2018. For the first time, I’m handing over one category to you! As each year draws to a close, I pick the most intriguing celebrity baby names. Some of them are just plain cool. Others might help set the trends for a new generation. Sometimes it’s sibling names or family traditions that stand out. And a handful? They’re names I just can’t stop thinking about. 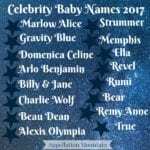 For last year’s news, check out Best Celebrity Baby Names 2017. Look back two years at Best Celebrity Baby Names 2016. Or go all the way back to Best Celebrity Baby Names 2015. But, as I wrote with the girls’ list, lately another question has been on my mind. What are the true crowd favorites? Where’s the broadest possible consensus that a celebrity baby name is a stand-out choice – even if the parents were just the family next door? And so we’re going to have a contest. I combed through the lists of 2018 births to find the names that feel most likely to win widespread approval. They’re mainstream, but not boring. Rising names that feel stylish, but not too out-there. Because the out-there? Those are coming in my list next month! Sebastian – A dashing name for a little gentleman, Sebastian has long been in steady use. But only in recent years has Sebastian become a mainstream favorite, at least in the US. Lin-Manuel Miranda has a Sebastian. Now America Ferrara does, too. Her son with Ryan Piers Williams was born in May. He’s Sebastian Piers, but they’re calling him Baz for short. At #22 in the US, it’s the most popular of the potential favorites for the year. Isaiah – First it was Carrie Underwood. Now Rashida Jones and Ezra Koening have chosen the name for their son, born in September. An Old Testament boy name, it’s tough to call Isaiah trendy. But it’s undeniable that this name carries a cool, edgy sound – even as it rises up the US popularity rankings to #47. Axel – Late night talk’s Seth Meyers tells the best stories about his sons’ births. This April, he and wife Alexi Ashe welcomed their second son in an emergency delivery in the lobby of their apartment building. His name? Axel, a mix of the edgy and the traditional. It comes from Old Testament Absalom, via Danish. The x factor, and singer Axl Rose, lend it some serious swagger. The name currently stands at #105. Miles – John Legend and Chrissy Teigen chose a fast-rising favorite for daughter Luna Simone. Son Miles Theodore received an equally on-trend, but reasonably traditional, name. Like Luna’s middle, Miles nods to a famous musician. And it brings to mind so many references, from Myles Standish of Plymouth Rock and the history books to Miles Morales, the new Spider-Man. The name ranks #110. Charlie – There’s something cozy about Charlie. It’s the name of many a children’s book hero, a choice both timeless and current, all at once. Classic Charles stands at #49; casual Charlie at #214. But so many of those boys named Charles use Charlie in every day life, making it tough to know precisely how common this one really feels. Brianna Brown and Richie Keen welcomed son Charlie Zane in July. Others celebs with boys called Charlie include Zooey Deschanel (Charlie Wolf) and Jeff Goldblum (Charlie Ocean). Beckett – I couldn’t wait to hear what Michael Phelps and wife Nicole named their second son, a brother for Boomer. After choosing a wildly non-traditional choice for their first, they moved back towards the middle with Beckett’s name. It’s a rising favorite, a cool surname with a literary vibe. 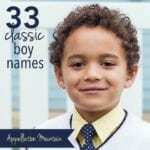 The name ranks #226, a solid choice for a son. Louis – Will and Kate surprised us with their name choice for their third child. Prince Louis Arthur Charles joined George and Charlotte in April. Both of the older Cambridge kiddos’ names have proved influential. And so might Louis. After all, parents love classic boy names – but we’re always after the next Max, Henry, or Theodore. At #277, Louis is plenty familiar – but not yet common. Crew – Oh, how I loved speculating what Chip and Joanna Gaines would name baby #5! They had such a pattern set for their older children’s names! When baby Crew arrived in June, he was welcomed home by Drake, Ella, Duke, and Emmie Kay. I think it fits in beautifully. At #712, it’s more unexpected than the other names on this list, but I think it feels more mainstream than not. I’d call it a preppy hellraiser name, which seems like a style parents love. Now, time to vote in the boys’ opening round! And don’t forget the girls’ contests. A match-up between sophisticated Sebastian and cool Crew. Two different takes on traditional: Biblical Isaiah or regal Louis? Two modern takes on cool face off in this match-up: Axel or Beckett? Two names with a certain kind of jazz compete: Miles or Charlie? That’s all for this round! Vote for your favorites, and check back next week to see which names advance. I love the name Isaiah! In fact, if my youngest sister had been a boy she would have been Isaiah. We already have the next two boys names picked out but I would love to have a little Isaiah of my own!